Tune into NBC's Rock Center this Friday night at 10pm ET to see exclusive clips from Joanna Rudnick's in-progress documentary On Beauty. 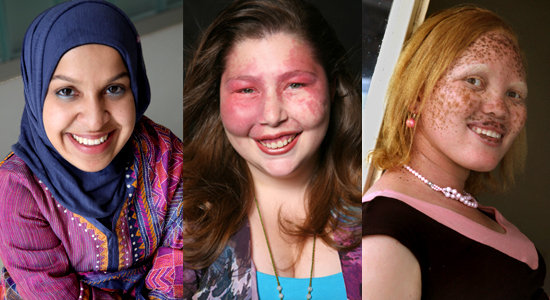 The show is highlighting the work of photographer and activist Rick Guidotti and his organization Positive Exposure. A former fashion photographer who now seeks to redefine beauty by focusing his lens on individuals living in the shadows of overt, physical genetic conditions, Rick's work with Positive Exposure is at the core of On Beauty, which weaves Rick’s decades-long fight to challenge public perceptions of difference with the stories of three women who have overcome rejection by their peers, brazenly stood up to society’s inability to accept difference, triumphed over their own physical obstacles, and become tireless advocates. Read more about the film here. The Rock Center segment profiles Positive Exposure's challenge to the way the medical community sees genetic differences, and their goal of replacing the dehumanizing images from medical textbooks with photographs that speak to/represent the person, not just the condition. Joanna Rudnick states: "It's a remove the "black bar" movement and Rick won't be satisfied until a new parent can Google a child's condition and see one of his photographs - of humanity of motion of childhood - rather than a disassociated body with a black bar masking and shaming their identity." Featured will be footage from the current rough cut of On Beauty featuring Nadia Merchant, a pediatric resident at Dayton Children's who will never let size (Nadia was born with a genetic form of skeletal dysplasia), stares or naysayers get in her way. As she says: "People may think my biggest challenge is short stature - maybe that's your challenge, but not mine." See more of Nadia's story. The piece also features an interview with Jenny Howe and Alisha Peters talking about how Rick gave them an unbelievable gift by capturing their children (both of whom have a Chromosome 18 condition) the way that they see them - not by the limitations, but by the life and light inside. The film is still in-progress and in need of significant funding to cover the costs of final production, editing and audience outreach. Please donate to On Beauty. On Beauty will be Joanna Rudnick's follow-up to the Emmy-nominated In the Family (2008), which is still continuing to make an impact on discussions of hereditary BRCA gene mutations, preventative cancer surgery, and genetic patenting. Since then, Joanna has had two children, been diagnosed with breast cancer, finished treatment, and completed the following chapter of having a bilateral mastectomy and oophorectomy. Still shooting – help complete Joanna Rudnick’s meditation on ideals of beauty.